The Edmonton and District Quilt Guild is having a Quilt show this weekend. To view the poster with all the information Please check This Out I have a booth to promote my long arm machine quilting and to sell some hand dyed fabrics. 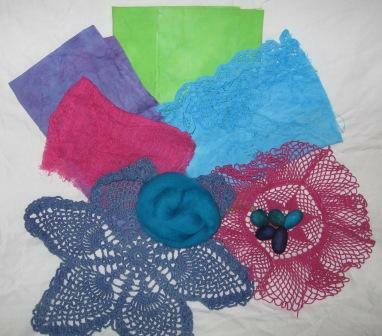 I have been very busy making up kits and dyeing and washing and cutting and sorting and pricing and packing. You get the idea. 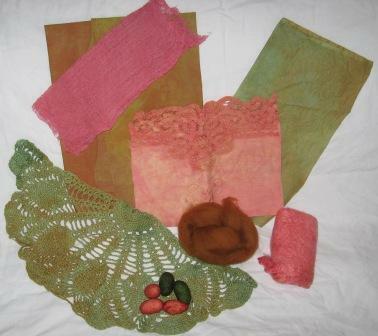 Here are two of the mixed fibre kits I have made for sale. They have a Fat Quarter of quilting cotton, some cheese cloth, some shear cotton, a vintage dolly, a vintage napkin or hankie, a roving of wool, 5 silk cocoons and then the fall kit has a silk hankie and the bright kit has a extra dolly as I ran out of silk hankies to dye. Some of the kits do have a little variation. I know some have a strip of lace or other wool or extra dollies. That is part of what makes them fun. I am pleased with all the colours I got done. Some in Blue that are kind of winter like, Fall (like below), Spring, Neutrals, Jewel bright (like above), pink and green, and all green and a few others. At the last booth I did, I sold out of these in the first day. I am taking more this time. I love the pink and green one Cathy- I am looking forward to going to the show this weekend. It is my treat to me for getting through report writing. I am sure you will sell out fast.